Today went to Deccan College, one of the oldest colleges in Pune with outstanding architecture. 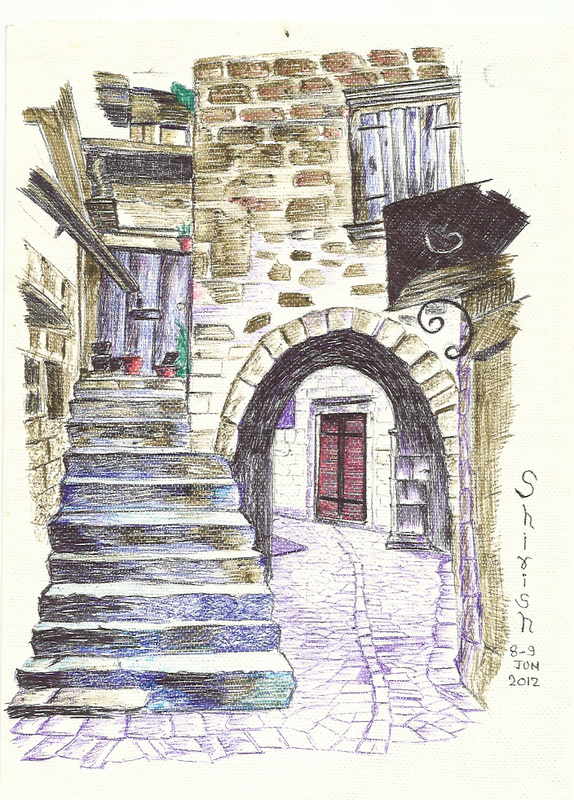 Once I reached, I realized that I had forgotten my brushes and pens at home! 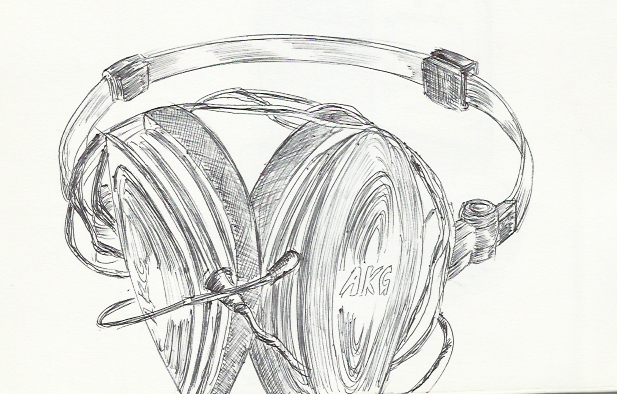 Luckily found a blue ball point pen in the bag, and decided to do the sketch using that one. This sketch was done when I stopped on my way home from office. I was parked at the roadside waiting for my friend, when I saw this interesting scenery. 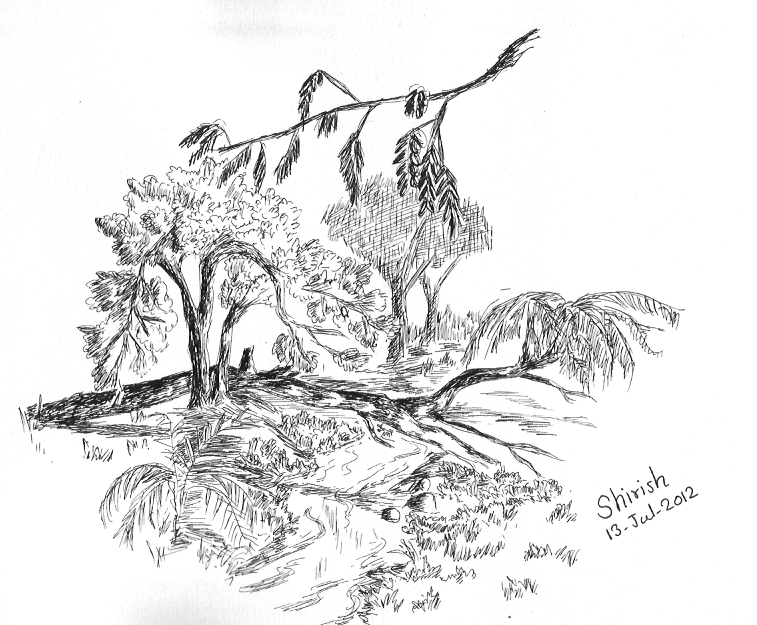 Drawn using file point pens on drawing book paper. I was in an auditorium for a program a couple of days ago. I reached there a bit early. 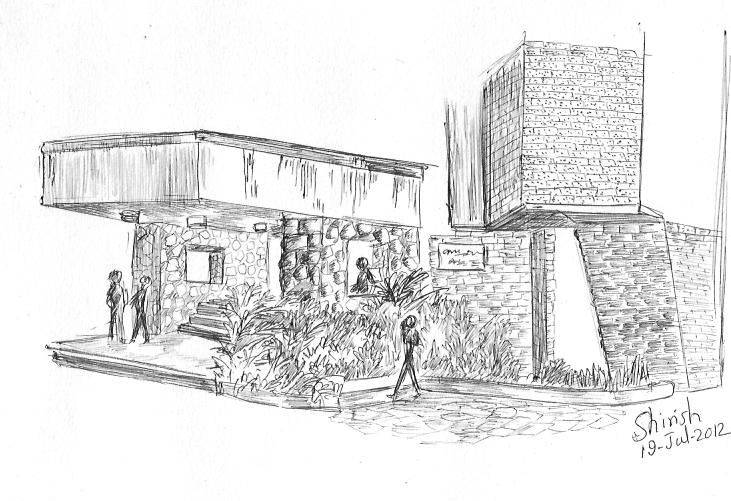 Quickly sketched out the rough layout within 10 mins I was outside the auditorium, and finished it the next day in my leisure time. 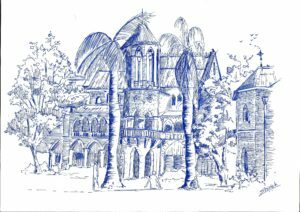 Ball point pen on drawing paper. Yesterday I was sitting at an eatery in a mall. Just in front of me was this small snacks shop. 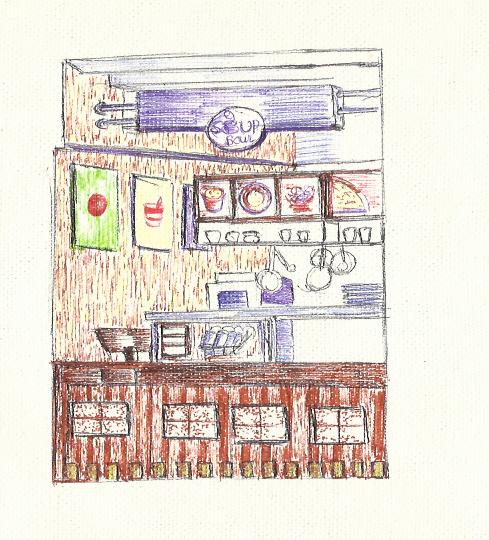 While I was waiting for my order to arrive (and till 10 minutes after it arrived), I drew this small sketch of the snacks shop. Ball point pens on hand made paper, 15 minutes. Today I was stranded at a place for around 30 mins. This tree was right at an arm’s distance from me, and I could see all the interesting patterns on the bark of this tree. It’s always feels so natural to draw these rough textures on the hand made paper! Ball point pen on hand made paper, 25 minutes. Yesterday I was sitting at a coffee shop. This house, surrounded by trees and bushes, was across the street. 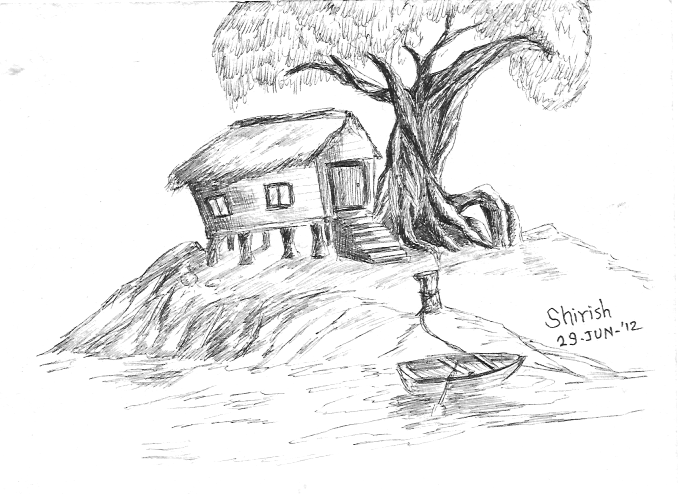 While I was waiting for my sandwich and coffee, I quickly sketched it using pencils on hand made paper. Today I finished this sketch using black ball point pen. Total time 1hour. 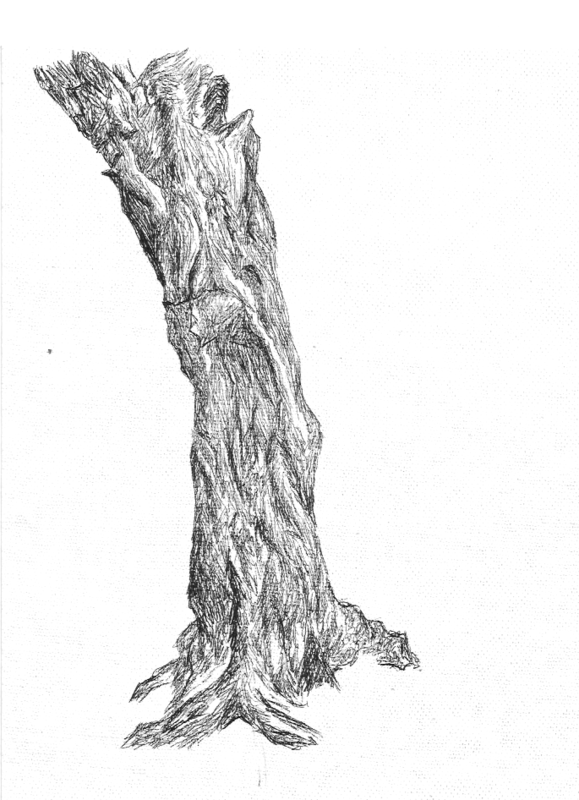 Did this as a practice to draw tree trunk. Ball point pen on hand made paper. I was recently browsing through a travel magazine, when I came across a photograph of a narrow alleyway in a town in Croatia. It was a challenging, yet fascinating subject. It has a lot of converging lines, many textures, different light areas, and a wonderful perspective. I drew this with ball point pens on hand made paper over a span of 2 days, 1.5 hours each. This barren house on my way home always intrigues me. 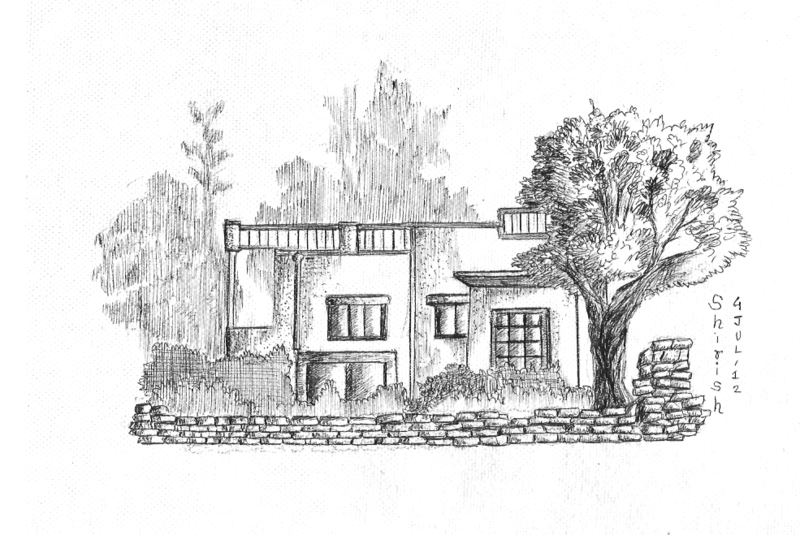 Some days ago, I had made a B&W sketch of this house and a tree on its left side. 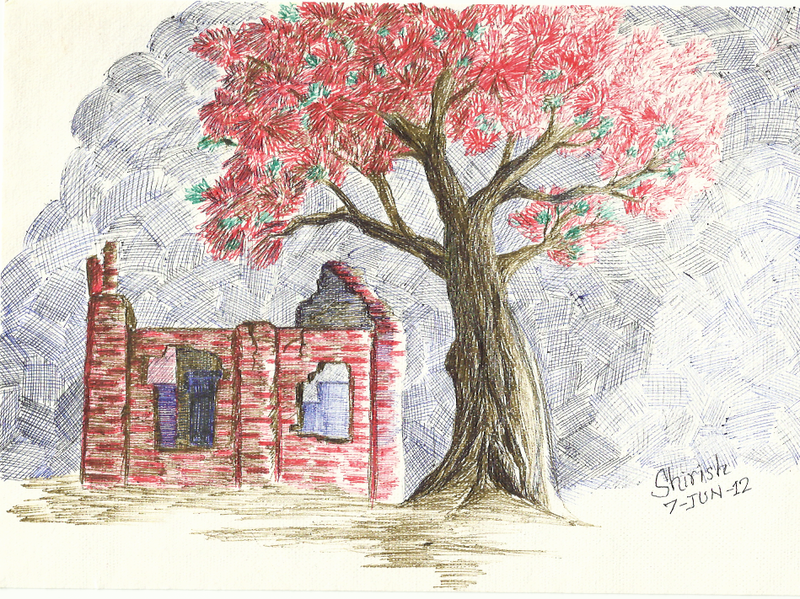 Today I made a color ball point pen sketch of this house with the red hot tree on its right side! I made a quick outline of the tree and house, then took some photographs on my cell phone before the light faded. Then I returned home and completed the sketch. I was extremely bored and sleepy, when I saw this half crumpled bottle on my desk. 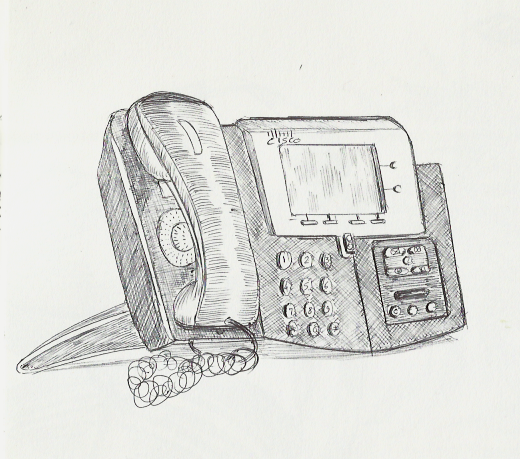 It was lying there for so many days, but I had never seen it as a model for ball point pen art … until now! What do you do when you are stuck in endless meetings? Find beauty in the most mundane objects, of course!